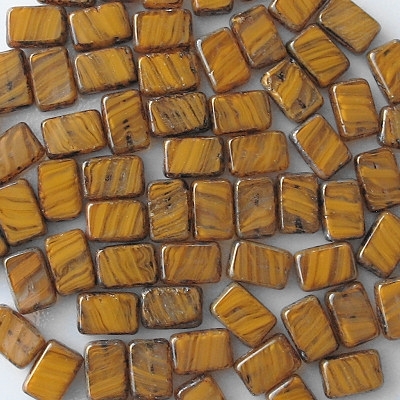 12mm (long) x 8mm (wide) x 5mm (thick) rectangles with polished surfaces or "windows". 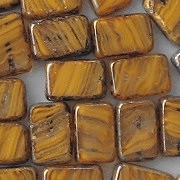 Swirls of opaque orange in clear glass with a brown mottled "picasso" coating around the edges. I eliminate seriously defective beads before shipping. I can't eliminate every bead which has a slight defect, so I use my judgement as to which defects are so serious that the bead can't be used. Certainly, cracks, deep or long scratches, large pits, partially polished sides, large spots of picasso coating on the sides, and malformations are all enough for me to eliminate a bead. But I may not eliminate a bead if it has very shallow scratches, small pits, or very small spots of picasso coating on the sides, or other small anomalies that don't ruin the overall appearance. Translucent beads which have gotten picasso coating in the holes, so that the holes are dark, are not eliminated. If you receive any beads with serious defects, that means that I overlooked them, and you should contact me for a pro-rated refund. 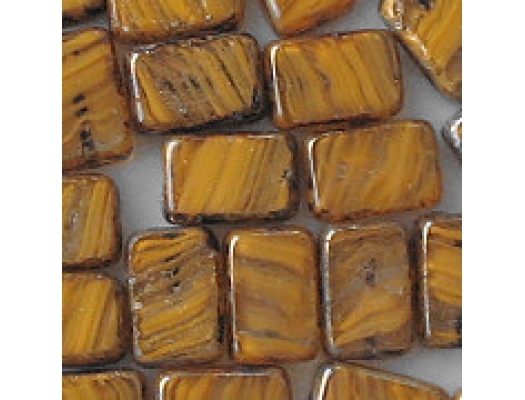 These beads are more rustic-looking than most polished beads that I sell. As I said above, I am eliminating the worst of them, but even the best of them don't appear as perfect as some other polished beads do. Added later: When I started to work with the beads, I discovered that a high percentage of them had chips around the edges, and that I was discarding more of them than I expected. That made the remaining beads all the more expensive to me, so I had to raise the price a little (from $3.50 to $4.00). My choice was either to eliminate all the beads with chips, or pass some of the defective beads through, and I didn't want to do the latter.